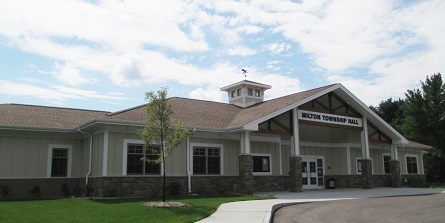 Welcome to Milton Township’s (Cass Co. Michigan) Guide to Government Services and Community Information. This website is intended to be a convenience for our residents, businesses, and visitors. If you have questions, comments, or need further information please visit our Contact Us page and let us know. Feel free to contact Elected Officials and Departments for additional information by clicking on the email listed under the heading. Please check our News and Announcements section below for regular updates and meeting notices. The Milton Township Board of Trustee's are seeking an individual to fill the position of Trustee on the board. If you are interested, please email a letter of interest to: Milton@miltontwp.org. The Board of Trustee's would like to invite those interested to a "Meet and Greet" at Milton Township on Tuesday April 30th at 6:00pm. Milton Township's Big Spring Clean Day will be Saturday May 4th from 7am-11am or until the dumpsters are full! FREE for all Milton Township residents: Tire and Trash collection, Paper shredding, Metal recycling, medicine drop off and a Goodwill truck will be here! Freon removal will be offered for $25.00. Bring your appliances and dispose of them properly! NEW this year: Computer hardrives can be shred on site for $10.00 per drive! Rent Milton Township's Great Room! The large conference room for meetings or training is also available for rent Monday through Friday from 9:00am-5:00pm. This room seats 14 around a large conference table. Each year the Milton Township Planning Commission reviews the current status of the roadways of Milton Township. After this review, a recommendation is made to the Milton Board of Trustees. The board of trustees reviews the recommendation and makes adjustments based on budgetary funding and public comment. After the review, they approve a new plan which the township works towards implementing. To view the plan, Click Here. Future year’s road priorities can be adjusted due to changing road conditions, safety concerns, and budgetary funding. The planning commission and board of trustees welcomes public comment in this throughout this ongoing process.